Are you doing a double take at our header? We decided to use a few of our older headers during this month as we work on updating our blog. We will be changing it every few days as we move through the month. Friday is a great day for flashbacks. Here are a few of Mom's favorite group shots. Such a wonderful group of Flashbacks for Friday!! It's so nice to see pictures of my beeYOUtiful Ciara! What a nice bunch of doggies! We wish we had taken more pictures when we still had our angels Charisma and Ginger. Those are all wonderful. We always enjoy seeing again those who have left. It's great to see your Angels in the header. We did do a double take at it but it fits with your Friday Flashback theme. We love those, they sure made us smile! Those are just terrific flashbacks. All the pictures are terrific and it is so much fun seeing them all again. Have a fantastic weekend. I smiled all the way through it. Although it is sad that three of those four have passed on, I am so glad to have "known" them through your blog. 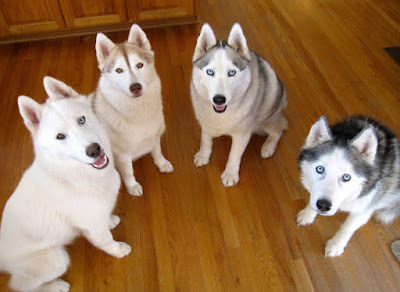 And it's really fun to see Lightning grow up next to them, and to know that he is passing along your family's Sibe traditions to the new youngsters. Great photos! We will be excited to see the new look! Oh YES! Love the new/old header and it's always fun to take a tippy toe down the past.........love all the group shots too - look at all those sweet faces looking at Mom using the flashy box! We love this! What a great idea! I love the one in the grass. They all look so happy but, of course all Sibes love being outside. LOVE the header. For me, it's all new since I'm a recent follower. Change is a good thing and we're looking forward to your changes. Those photos are very special! Those pictures are wonderful! 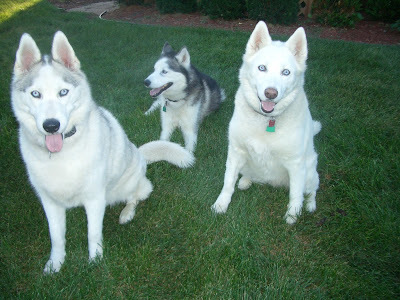 Our mom feels like she has her hands full with 2 huskies, and is in awe of anyone having more!